Following evaluation of its technically compliant bid to the European Space Agency [ESA], Galileo Industries, a joint venture with EADS Astrium as its principal shareholder, signed a contract to build one of Europe's first spacecraft entirely dedicated to satellite navigation. The 72 million contract for the GSTB V2 (Galileo System Test Bed) will be a precursor mission for the European satellite navigation programme. Its primary purpose is to demonstrate and validate all technologies previously developed under the Galileo programme and, if required, to secure the filings allocating global radio frequencies. The satellite must be ready for launch in 2005. Selection as a prime contractor for GSTB V2, confirms Galileo Industries as a major partner in the development of the Galileo satellite navigation system. Galileo is a joint initiative of the European Commission and the European Space Agency. Under civil control, Galileo, a global system of thirty satellites with its associated ground infrastructure, will provide an interoperable and complementary service to the US military GPS system. 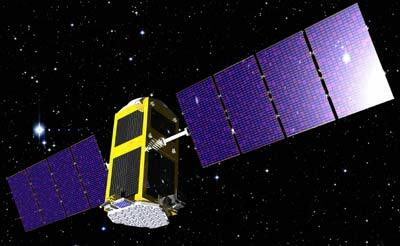 GSTB-V2/B will demonstrate the Passive Hydrogen Maser (PHM), the most accurate atomic ever launched to orbit. Developed under ESA contract, the PHM will play a key role for a wide range of high precision navigation applications. The satellite has been renamed GIOVE B (Galileo In-Orbit Validation Element) in November 2005. GIOVE B was retired from service on 23. July 2012 and began raising its orbit to an graveyard orbit.